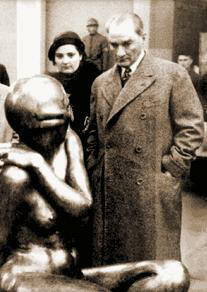 The State Art and Sculpture Museum (Turkish: Ankara Resim ve Heykel Müzesi) was built in 1927 by architect Arif Hikmet Koyunoğlu on the direction of Atatürk in Ankara, Turkey. 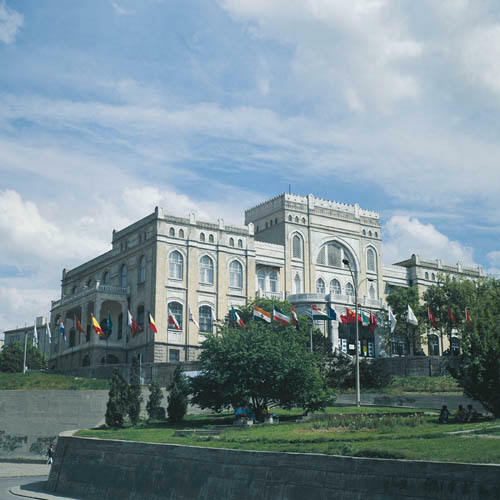 It is close to the Ethnography Museum and houses a rich collection of Turkish art from the late 19th century to the present day. There are also galleries for guest exhibitions. The Museum was reopened after restoration of the building in 1980. Today the museum, is a center of art at which the most outstanding works of the artists who played important roles in the development of Turkish Painting and Sculpture Arts, which have only a very rather short history compared to more traditional branches of arts, are exhibited. In addition to the collections of art works reflecting to formation and the development periods of Turkish Plastic Arts, and its classification, and to the library of Plastic Arts which fills the gap in this field, enriched every year by the donations of publishings, domestic or foreign, and a Foreign Embassies, or by new purchases, The Archives of Turkish Artists satisfactorily respond to the needs of researchers working in these fields. The protection of the works of Arts which is one of the most important responsibilities of the museum beside training, is done by employing a method particularly developed to ensure the most satisfactory results when dealing with the problems arising from temperature, humidity and sorting difficulties. Any damage due to aging which may occur in spite of all protection measured are restored by experts in the special unit which has been set up as a separate division within the Museum. During the restoration of the building in 1980, and in following years, another important point on which considerable stress was laid is the construction of workshops of painting, sculpture and ceramics, which serve artists, both amateur and professional. As for the security measures, whole building is furnished with closed-circuit TV, ultrasonic and firealarm systems so as to be able to control every part of the museum. In addition to be workshop at which painting and original printing courses that are demanded by the public beyond the capacity of the museum, special workshops for Turkish Ornamenting Arts, ceramic, and sculpture will be opened in short period of time. Exhibitions of painting, sculpture, ceramic, printing arts and photograph programmed to take place in Turkey within the framework of international cultural agreements, are exhibited in the three galleries reserved for periodical exhibitions; this, the art works of foreign countries are made known to Turkish Public. In addition, exhibitions of Turkish artworks selected from the collection of the Museum, are organized in Foreign Countries, within the framework of International cultural agreements. Besides these exhibitions, retrospective exhibitions organized by the General Directorate of Fine Arts; individual exhibitions and competitive exhibitions are among the other activities of the Museum. In the historical hall which has been transformed to its original design during the restorations, different kinds of activities such as concerts, theatrical performances and movie projections take place. Serving to public with its modern cafeteria, sales outlet and audio system the institution goes beyond an exhibition place for old artwork; comprising all attributes of modern Museums of Arts.